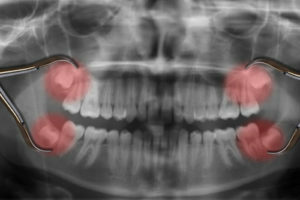 Wisdom teeth commonly start to cause problems between the ages of 17-21. The most common complaint is localised pain at the back of the jaw, which is constant, worsening and often debilitating. It occurs as the wisdom teeth try and push their way into the mouth. However, many people don’t have enough space to allow their wisdom teeth to fully erupt. Meaning the wisdom teeth are stuck half in the jaw bone and half sticking into the mouth – this is termed an ‘impacted tooth’. Impacted teeth are difficult to keep clean and often get infected. Left untreated, a sore wisdom tooth can result in a severe facial swelling and sometimes hospitalization.